I have a few things I'll be adding to the JetKat Design Etsy shop. They are leftover from a previous life, way back when I had a lot of time to print lovely stationery. I love these pieces so I brought them all the way to California just for you. 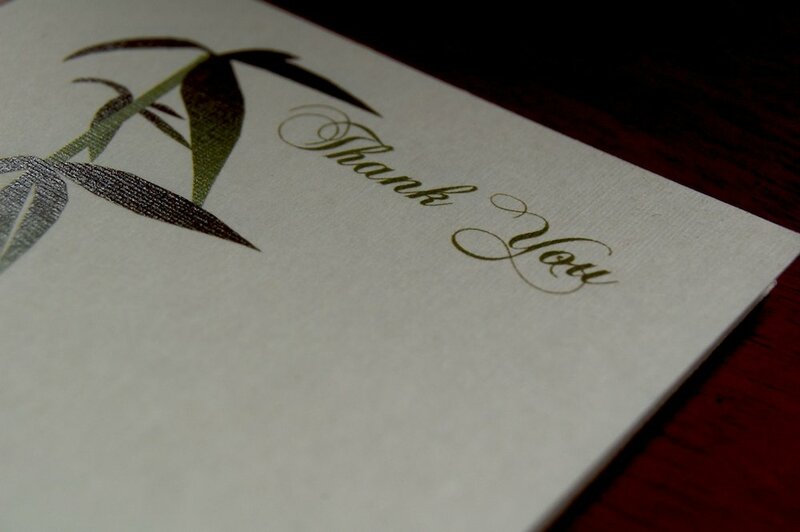 The first batch is this set of thank you cards with my bamboo illustration. They don't fit in standard envelopes. If I had lots of time on my hands, I'd totally make some sweet pink envelopes... but that's not going to happen, folks. So you can either make your own envelopes or just use them as notecards- stick them in lunches ("thank you for being the best person I know") or attach them to gifts ("thank you for having a birthday") or leave for a waiter -in addition to a monetary tip, of course. For some reason, my bamboo wedding invitation turns up a lot of hits to this website... is bamboo popular? I suppose so. Look at me, hip without realizing it; I love when that happens. These cards are about 3" x 5"
Bamboo Hello Cards :: Same set up as the Bamboo Thank You Cards, except these lovelies say "Hello." They are also about 3" x 5" and do not come with envelopes. They can be purchased from the JetKat Design Etsy shop.